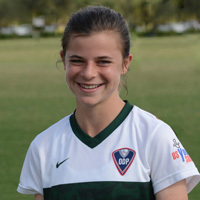 Lindsay is a member of the 2017 ODP Florida team and the 2017 Region 3 ODP Interregional Thanksgiving team. Lindsay is excellent technically and very confident on the ball. Lindsay is creative on the ball and will have no problem creating opportunities in the final 13/ She does a good job communicating on the field and understands tempo. Lindsay also has the ability to strike with both feet and can play both the pass and will shoot. She currently plays the 9 in a 4-3-3 system and makes great decisions on when to pass or shoot. Lindsay is a committed club player that wants to play at the highest level.